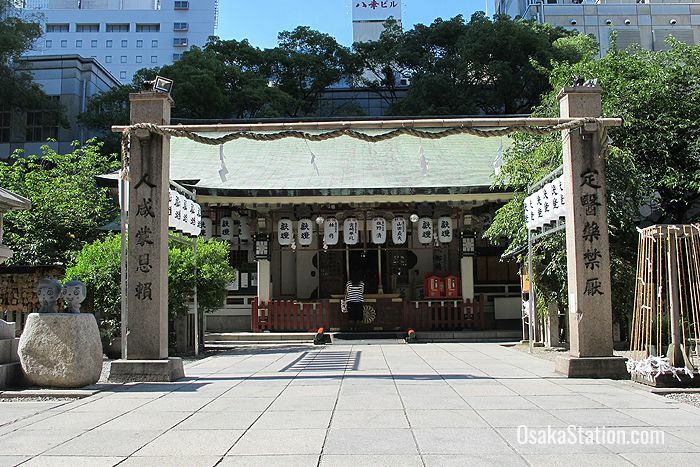 Tusyu-no-Tenjinja Shrine is the guardian shrine of the Umeda area and is said to have been founded 1,300 years ago on an island in what was then a marshy bay. 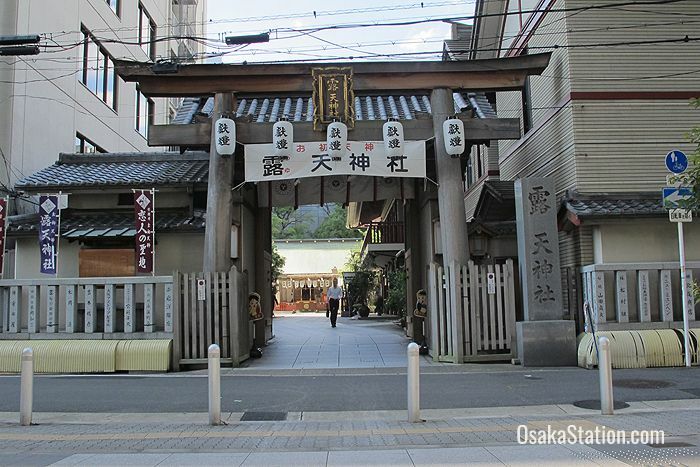 Today it stands at the end of a covered shopping arcade called Ohatsu-Tenjindori Shotengai, which is packed with shops, bars, and cheap dining options. The Japanese word for “dew” is “tsuyu”, and after his death Michizane was deified into the Shinto pantheon as the god of learning, Tenjin. That is why the shrine is called Tsuyu-no-Tenjinja, or often just Tsuyunoten. However, today the shrine is better known for its romantic associations as it is a key setting of the bunraku puppet play: The Love Suicides of Sonezaki. 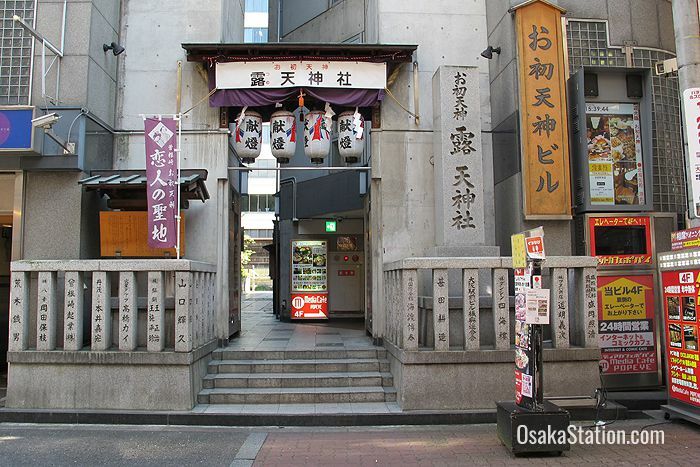 The play tells the tragic story of two star-crossed lovers, the geisha Ohatsu and the apprentice trader Tokubei, and it was supposedly based on a historical double suicide that took place at the shrine in 1703. In the play an unfortunate combination of family pressures, financial misfortune, and the betrayal of a friend, threaten to keep the lovers apart. Unable to live without each other, they meet at the shrine and take their own lives. You can read the full story at the shrine, which is now a popular spot both for young couples, and for those who are seeking true love. 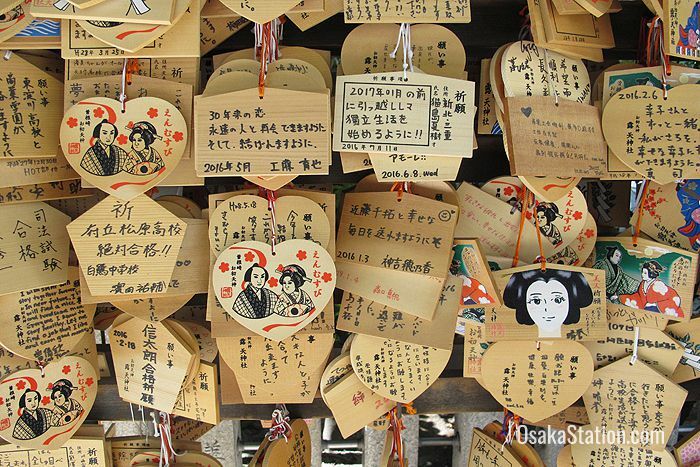 People write their prayers for success in love on special wooden plaques called ema, many of which bear the image of Ohatsu and Tokubei. 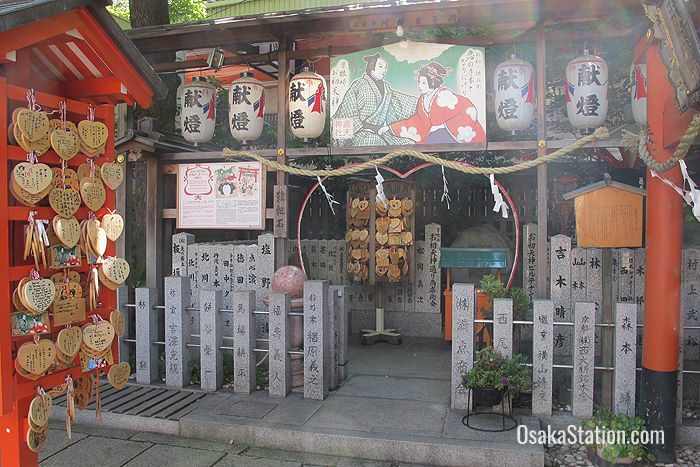 The shrine is also called Ohatsu-no-Tenjin after the heroine of the story, and there is a love sanctuary within the grounds where you can pray before a statue of the ill-fated couple. 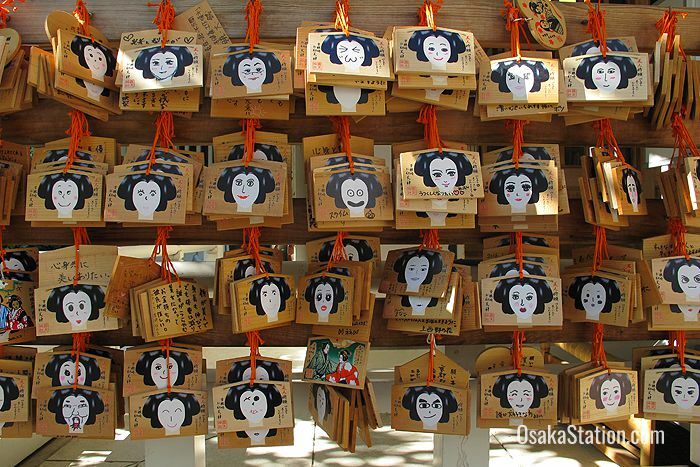 Young girls often buy ema plaques here that are shaped like the face of a geisha. To pray for personal beauty they draw in the face and hang these up before the main building of the shrine. 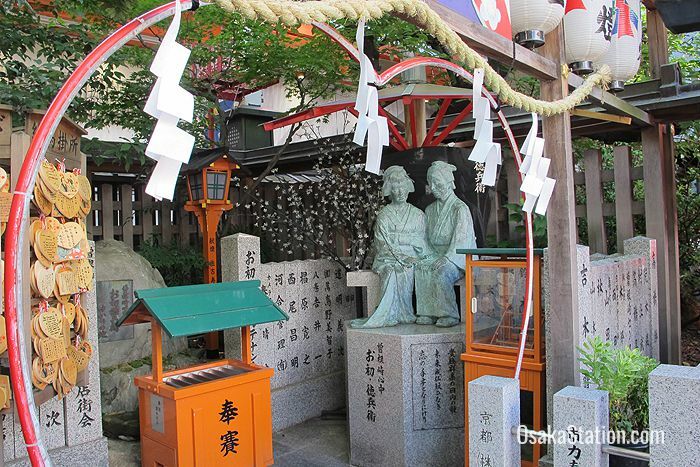 The shrine was destroyed during one of the bombing raids in 1945 that razed much of Umeda to the ground. Completely rebuilt and restored in 1957 it stands now as a symbol of the area’s renewed prosperity and resilience. On the first Friday of each month, the shrine is transformed into a lively flea market, and packed with stalls selling antiques, second hand clothing, bric-a-brac and all kinds of household goods. It’s a good place to pick up some unique local souvenirs at bargain prices. 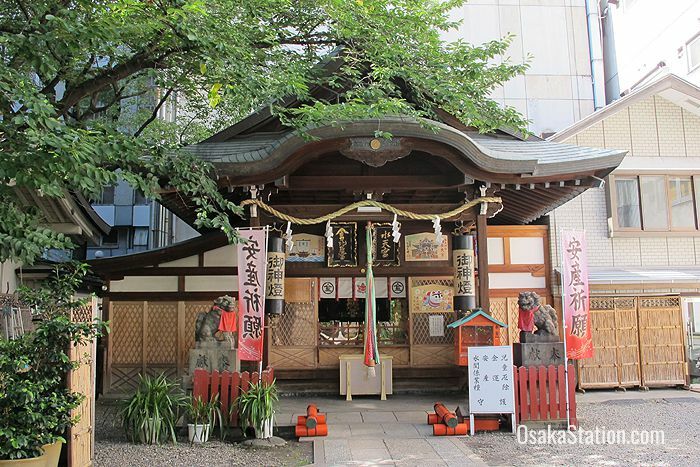 On the third Friday and Saturday of July the shrine hosts the Reitaisei summer festival with taiko drumming performances, lion dancing, parasol dancing, and a parade through the Umeda area. Like most Shinto shrines in Japan the grounds of Tsuyunoten Shrine are free to enter and always open. 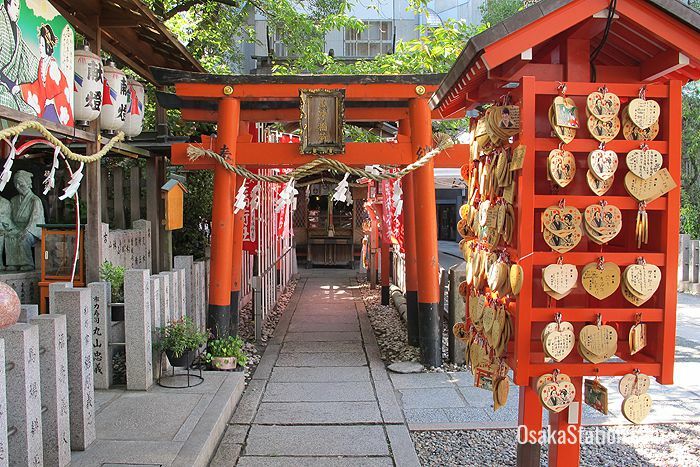 The shrine is a 10 minute walk south east of Osaka Station, and just 5 minutes from Higashi-Umeda Subway Station.